The fact that the 2-month recovery attempt from 16-Dec's 122.265 low has thus far failed to retrace even a Fibonacci minimum 38.2% (to 125.31) of Sep-Dec's (suspected 3rd-Wave) plunge from 131.01 to 122.265 would seem to reinforce our longer-term bearish count that this recovery is a correction within a broader bear. 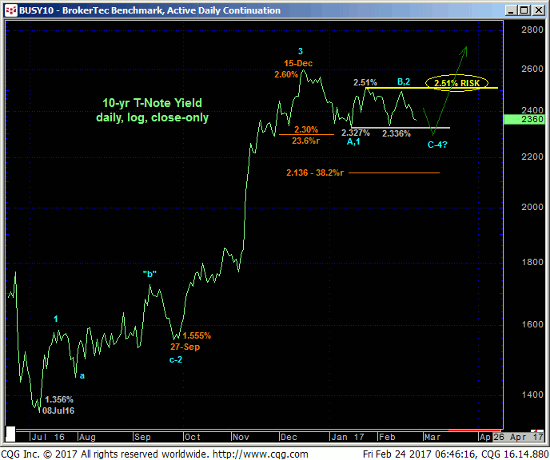 Basis 10-yr yields shown in the daily log close-only chart below, the relapse in rates has yet to retrace even a more minimal 23.6% of Sep-Dec's rate rise from 1.55% to 2.60%. 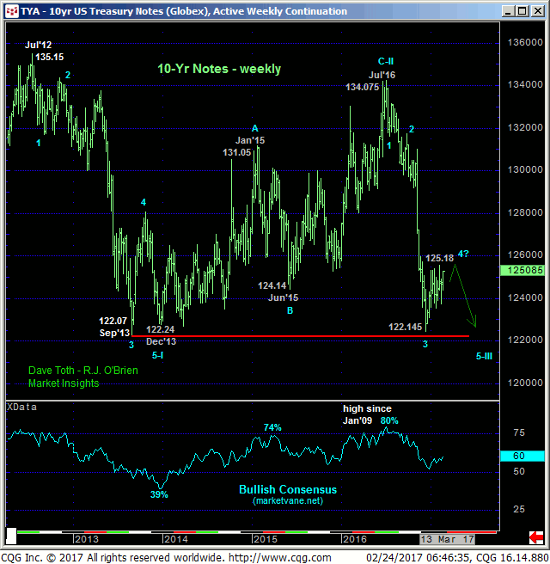 We will not be surprised by a break below the key 2.33%-area that has supported the market over the past five weeks, a break that could expose steep rate losses; hence our current cautious bullish view in the contract. However, traders remain warned to be extra vigilant in their watch for a bearish divergence in momentum in the contract and bullish divergence in mo in rates following a break above 125.12 and below 2.32%. Returning to a bearish policy after such a mo failure could present a fantastic risk/reward selling opportunity in the contract. Finally, the weekly chart of the contract below shows the magnitude of the major downtrend that serves as the backdrop for our longer-term bearish count. Nonetheless, corrective structures/environments within/against such a trend can be frustrating, agonizing beasts that simply are a fact of trading life. We always recommend a more conservative approach to risk assumption under such conditions as the odds of winning trading decisions are even more stacked against the trade then under less choppy circumstances. These issues considered, a neutral-to-cautiously-bullish stance is advised with a failure below 124.12 required to negate this call, re-expose the major downtrend and warrant a return to a bearish stance. 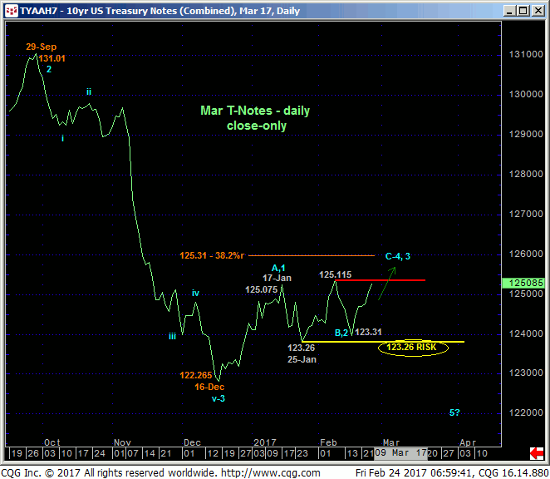 Former 124.29-area resistance is considered new near-term support ahead of continued gains that could include a break above 08-Feb's key 125.18 high. 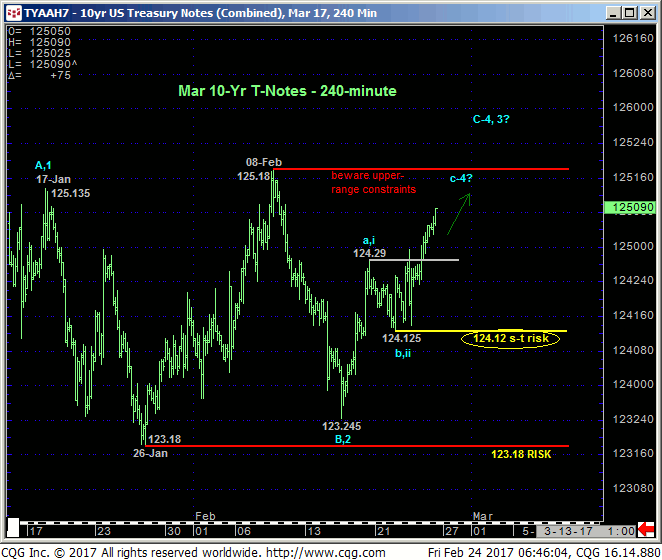 Once above 125.18 there is no way to determine the market's upside potential. And this potential should not be underestimated until and unless the market stems that rally with a confirmed bearish divergence in momentum.